The 39th SEEHN Plenary meeting under the subject “Promoting Health amongst Children and Youth in South Eastern Europe” was held on 23-24 November 2017 in Sofia, Republic of Bulgaria, organized jointly by the Presidency of the Republic of Bulgaria and the SEEHN Secretariat. 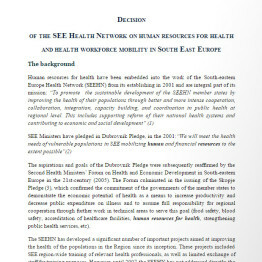 This event was attended by the National Health Coordinators(NHCs) of the Member States to the SEEHN, the partner countries and partner international organizations, directors of the SEEHN Regional Health Development Centers (RHDC) and the Ambassadors of the SEEHN Member States accredited to Bulgaria. The purpose of the Plenary meeting was to discuss the SEEHN major developments, activities and challenges during the term of the Bulgarian Presidency (SEEHN Presidency report June – December, 2017) and the next – Israeli Presidency (January 2018 – June 2018). The Action Plan for the implementation of the Chisinau Pledge 2017-2020, objectives, measures and health indicators, as Strategic Framework for the SEE Member Countries. Prioritization of Health promotion amongst children and youth by enhancing regional efforts and cooperation to improve children’s health, promote healthy lifestyles and to contribute to the prevention of NCDs, to accelerate the progress in the implementation of the SDG Agenda 2030. Additionally, the Plenary took important decisions on the following technical and business issues of major priorities: Executive Committee and Chair election. National Health Coordinators (NHC) status; SEEHN Secretariat (programme, budget, reports, staff); RHDCs (outcome of the technical meeting with RHDCs and SOPs); EC/TAIEX (challenges); Partners (joint activities).